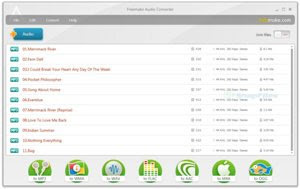 Freemake Audio Converter is an easy to use tool to convert audio files to MP3, WMA, WAV, FLAC, AAC, M4A (iPod, iPhone, iPad etc.) and OGG formats. You can choose from several presets or create custom conversion profiles to fit your needs. The program can batch convert multiple files at once and optionally join the tracks into a single file. Other features include an option to extract audio from video files and iTunes integration.